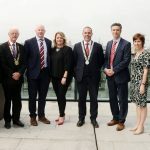 The official launch for the 2018 Cork City Sports took place at Johnson Controls headquarters, One Albert Quay. 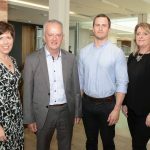 The sports was officially launched by Athletics Ireland CEO, Hamish Adams. 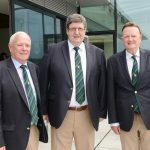 The annual Cork City Sports International Athletics Meeting now in its 67th year, takes place at the Cork Institute of Technology (CIT) Athletic Stadium, Bishopstown, Cork on Monday evening July 16th at 5.30pm and will feature a host of leading international athletes from around the world. Leading Irish athletes who will compete in Cork include Thomas Barr, Phil Healy, Ciara Mageean, Paul Byrne, Sean Tobin. 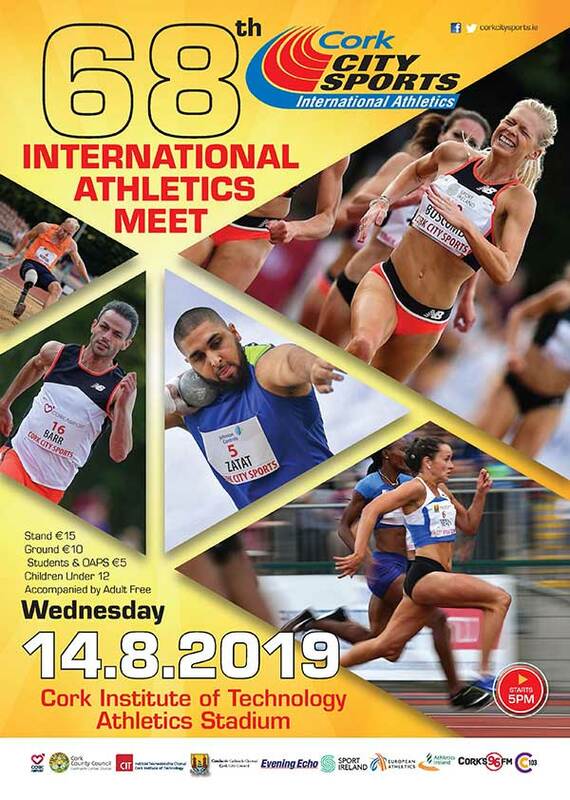 One of the highlights of the meeting will see the local sprint sensation from Bandon AC, Phil Healy, against former World Indoor Champion and last years defending champion Barbara Pierre in the 100M. Phil also takes on the Canadian Record holder, Crystal Emmanuel in the 200M. Emmanuel broke the 32 year old Canadian record at last year’s Cork City Sports and has subsequently been a finalist in the World Championships and Commonwealth Games. There are also a couple of very fast Jamaican athletes in both events. She wants to try and break the Canadian record two years in a row at the Cork meeting. The mens 200M will also be one to watch. Last year’s 100M and 200M champion, Sean McClean USA, is back to defend his titles. It will be a difficult task as he will be up against another Canadian Bismark Boateng, Irelands Thomas Barr, and two extremely fast Americans, Curtis Mitchell and Dedric Dukes. Boateng is currently ahead of Andre DeGrasse in the 2018 Canadian rankings. Irish star Thomas Barr is getting himself ready for the European Championships in the 400M Hurdles and is using the shorter distance at the Cork City Sports to sharpen his speed. The mens mile will be an outstanding race. Last year nine athletes went under the magic four minute barrier. This year five out of the top six in that race are back to try and take the title. The field will also include two extremely fast Americans, Johnny Gregorek and Will Geoghegan who have featured right throughout the American Indoor season. Sean Tobin from Ireland will also be in the field after running a magnificent 3.57.00 here last year to take third spot. There is a strong possibility that the winner of this year’s Wanamaker Mile at the Millrose Games, Chris O Hare, will also contest this event. Chris is also a winner at last year’s London Diamond League and one of Britains best ever middle distance athletes. Last year saw a wonderful womens hammer competition producing a meeting record of 71.19M by Sweden’s Ida Storm. If Ida is going to retain her title this year she will probably have to match that distance or maybe exceed it. Her competition in the event will include Kathrin Klaas from Germany, fourth place at the London Olympics and Sophie Hitchon, Britains number one and Bronze medalist at the Rio Olympics. Also in the field will be another Swedish athlete Tracey Andersson who is also a 70M + thrower. In the mens High Jump there is sure to be some exciting competition between the Gold and Silver medalists at the recent Commonwealth Games, Brandon Starc of Australia and Jamal Wilson of the Bahamas, respectively. They will not have it all their own way as there are also two very good Malaysian jumpers in the field with personal bests of 2.30M. With athletes from Ireland, USA, Australia, Ethiopia, The Bahamas, Jamaica, South Africa, New Zealand, Czech Republic, Sweden, Spain, Japan, Kazakhstan, Canada, Kenya, England, Poland, France, Hungary, Bulgaria, Russia, Germany and Slovenia, already confirmed, a feast of athletics goes ahead on Monday 16th July with a 5.30 pm start; a great evening out for all the family at CIT Athletics Stadium, Bishopstown. 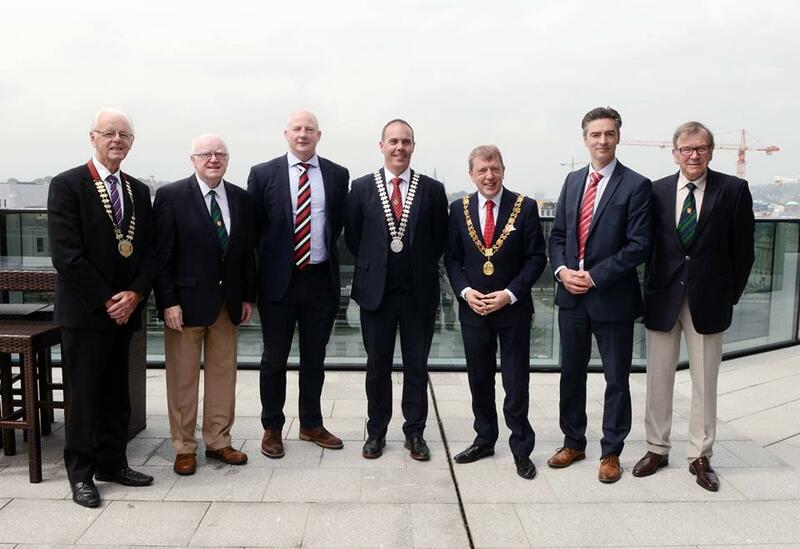 The Cork City Sports Committee wish to acknowledge the financial support of the Irish Sports Council, Sport Ireland, Cork City Council, Cork County Council, Cork ETB, Cork County Board AAI and Leevale Athletic Club. 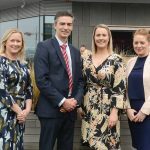 We would like to thank our Event Sponsors, Johnson Controls, Cork Airport, John Buckley Sports, Leisureworld, AON Hewitt, Musgraves Super Value /Centra, Henry Ford & Son Ltd ,KBC Bank, Barry’s Tea, Johnson & Perrott Ltd., The River Lee Hotel, FDC Financial Services, Dukes Coffee Company,JCD,Group, EVROS, DPS Engineering,, Glenilen Farm, O’Callaghan Properties, FMC Pharmaceuticals, O’Leary Insurance Group,, and our Media sponsors, Evening Echo and Cork 96FM C103. 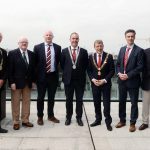 L-R, Paddy Buckley, Chairman Cork Athletics, Tony O’Connell, Chairman Cork City Sports, Hamish Adams, CEO Athletics Ireland, Cllr Declan Hurley, Mayor of County Cork, Cllr Tony Fitzgerald, Lord mayor of Cork City, Donal Sullivan, VP Johnson Controls and Frank Walley, President Cork City Sports.